Michael Carrington: Lawyer. Member of Parliament. Speaker of the House. This guy has got more front more front than Harrods! It was not until he was ordered by the High Court to return $250k to a client that he did so. Recently though the man has had the audacity to imply it is he who is the victim … and has publicly stated he paid the money back so can’t understand what all the fuss is about! Mr. Joe Public or any of his relatives would’ve been incarcerated long ago for theft – another lawyer was recently disbarred for very similar breaches …but this guy seems to have escaped punishment, sanction or even investigation by either the government or the Bar Association. Carrington remains an MP, a lawyer and Speaker of the House despite local and international demands for his resignation. We can only speculate why Michael Carrington still in post – so here goes – maybe he excels so spectacularly but quietly behind the scenes that he is rendered absolutely irreplaceable …or maybe he has really important and powerful friends… or maybe he knows where the cupboards are that hides lots and lots and lots of skeletons …or maybe… it’s all the above! Michael Carrington should resign – common decency demands it – but what would he do then? Punters wanting legal services, in property matters especially, will learn that it would be the height of folly to trust Michael with a cocoa bean let alone a red cent – so lawyering is out. Google or any half decent search engine will help see to that – all that’s left for him is politics, for now. Hopefully though the electorate will remember when that time comes around again. So Michael: Do the reputation of the DLP, the country and yourself a massive favour … and sod off! The new issue of Ping Yark has hit the streets. Always irreverent, always interesting to Bajans at home and over and away. 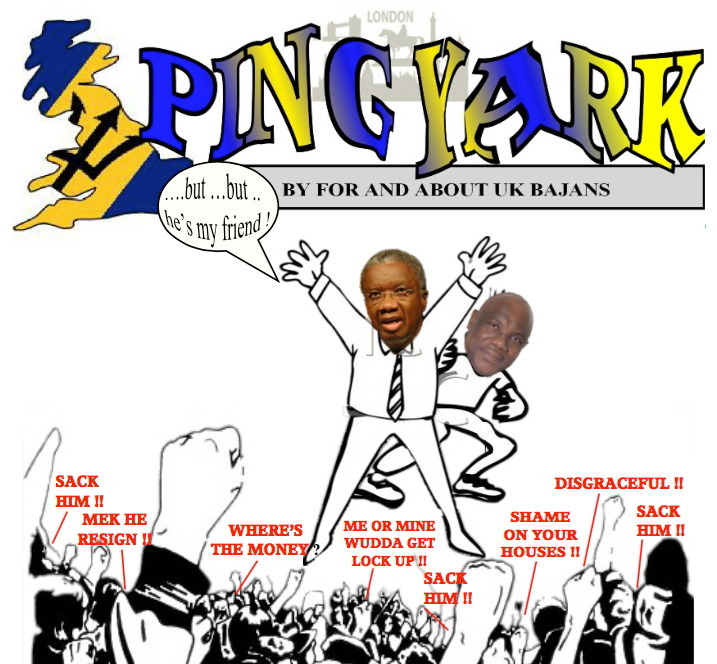 Yup… Leigh Bourne and all those Bajan expat rascals who publish Ping Yark say that at least ten Bajan High Commission employees hold Diplomatic Status. One additional employee is desperate to get the status. Editor Leigh Bourne and friends just launched another issue of Ping Yark: the irreverent Londontown newsletter published by homesick Bajans for other homesick Bajans. Police Commissioner Darwin Dottin: Hey man… know when to hush! Dear British food manufacturers: This is a cow. This is not! The Nation Newspaper: Relevant? Spreading malware? DLP UK still in self-destruct mode. Health: Is food your medicine? Rihanna and Chris Brown – do we care? Should we? Bajans in UK lament pork shortage as ‘white flight’ hits and Muslims take over neighbourhoods. Black history: How Bass Reeves went from slave to being the first black Deputy US Marshall. You can download Ping Yark in pdf format for free: right here!